Arsenal will be looking to extend their unbeaten run to sixteen games when they host Wolves at the Emirates on Sunday. After winning eleven consecutive games, Arsenal have drawn three of their last four games in all competitions, including last week’s 1-1 thriller in the Premier League against Liverpool. Wolves have lost their last three Premier League games, however, the newly promoted side sit in a respectable 11th position in the league after a run of impressive form early in the season which saw them hold Manchester City to a draw at 1-1 Molineux before picking up a valuable away point at Old Trafford. Arsenal will be without Danny Welbeck after he sustained a horrible injury in Thursday’s Europa League fixture which may see him miss the rest of the season. Stephan Lichtsteiner also picked up an injury and has been ruled out of Sunday’s game, while Unai Emery’s side may also still be without Nacho Monreal who is struggling for fitness following a hamstring injury. Mohamed Elneny, Laurent Koscielny and Konstantinos Mavropanos are all still unavailable. The visitors have a fully fit squad at their disposable as Diogo Jota is expected to be fit again after a hamstring injury. Arsenal predicted XI: Leno, Bellerin, Holding, Mustafi, Kolasinac, Torreira, Xhaka, Ozil, Iwobi, Aubameyang, Lacazette (4-2-3-1). Wolves predicted XI: Patricio, Bennett, Coady, Boly, Doherty, Moutinho, Neves, Jonny, Costa, Jimenez, Traore (3-4-3). Pierre-Emerick Aubameyang will be keen to continue his remarkable scoring form as the Gabonese striker received the Premier League player of the month award for his contributions - the first Arsenal player to win the award since Olivier Giroud in March 2015. 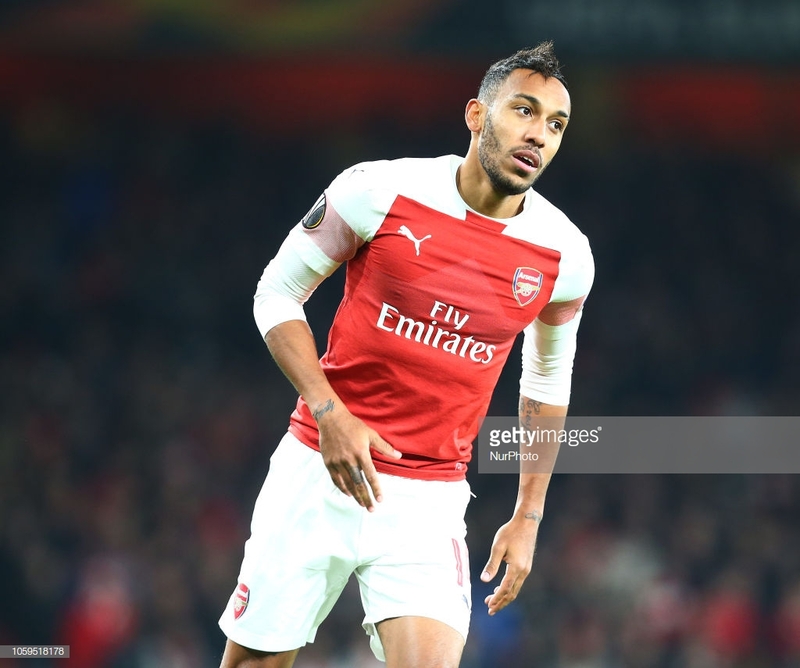 Aubameyang scored five goals in three appearances in the month of October despite only starting in one of those games, showing his prowess as an impact player which has seen him become one of the most feared strikers in Europe over the last five seasons. The 29-year-old is often deployed on the wing but has managed to form a notable bond with Alexandre Lacazette which allows them to interchange positions throughout matches and has bolstered Arsenal’s attacking options since arriving last January. Despite winning the player of the month, Aubameyang’s finishing touch to Arsenal’s stunning goal against Everton was narrowly beaten by his teammate Aaron Ramsey who won Premier League Goal of the Month for his audacious flick against which rounded off a flowing team move. The signing of Ruben Neves has been pivotal to Wolves success which saw them storm the Championship last year, winning the league with 99 points. Neves became one of the most prominent young players in world football when at just 18 years of age, he became the youngest ever captain in Champions League history with Porto. Neves was reunited with his former manager Nuno Espirito Santo when Wolves made the huge coup of gaining the services of the Portuguese midfielder. Neves has formed a formidable partnership in the centre of midfield with compatriot Joao Moutinho who has added a wealth of experience and quality to Wolves midfield. Meanwhile, Lucas Torreira has made a monumental impact to Arsenal’s midfield in his first few months at the club, filling a void in defensive midfield which has left the Gunners exposed numerous times in recent seasons. Torreira will be tasked with limiting the supply to Neves and Moutinho and will face a tough taste against two very gifted players, however, the Uruguayan will be unlikely to back down from the challenge after putting in a stunning performance in Arsenal’s 1-1 draw with Liverpool. Arsenal’s midfield looks vastly stronger than last season after the addition of Torreira has given Granit Xhaka more confidence with the former taking the brunt of most of the defensive responsibility and legwork in midfield. Meanwhile, Xhaka is able to focus on his strengths, with his dynamic passing range helping Arsenal tick in midfield. The Gunners are unbeaten in their last 19 games against tomorrow’s visitors in all competition, while Wolves last win against the north London side came in 1979 with a 3-2 win at Highbury. The home side have also won seven out of eight of the pair's meetings in the Premier League, but Wolves did earn a draw on their last visit to the Emirates in December 2011.